Let us now turn to trout fishing in Scotland. The humble Scottish trout might be considered, by some, the poor relation in the salmon family. 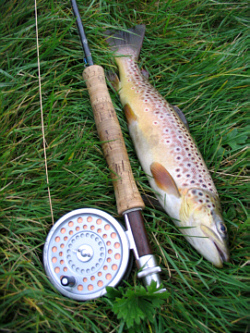 Nevertheless, despite its lowly station, the brown trout gives wonderful fly fishing sport all over Scotland to both local and visiting anglers. Where trout fishing scores over the salmon is in its lower cost and generally wider accessibility, for example through local angling clubs and associations, although recent legislation has imposed restrictions on where anglers can fish, and further proposed legislation threatens to exclude anglers from many of our lochs and rivers. Nor is success with trout in Scotland so dependent on increasingly unpredictable river levels. 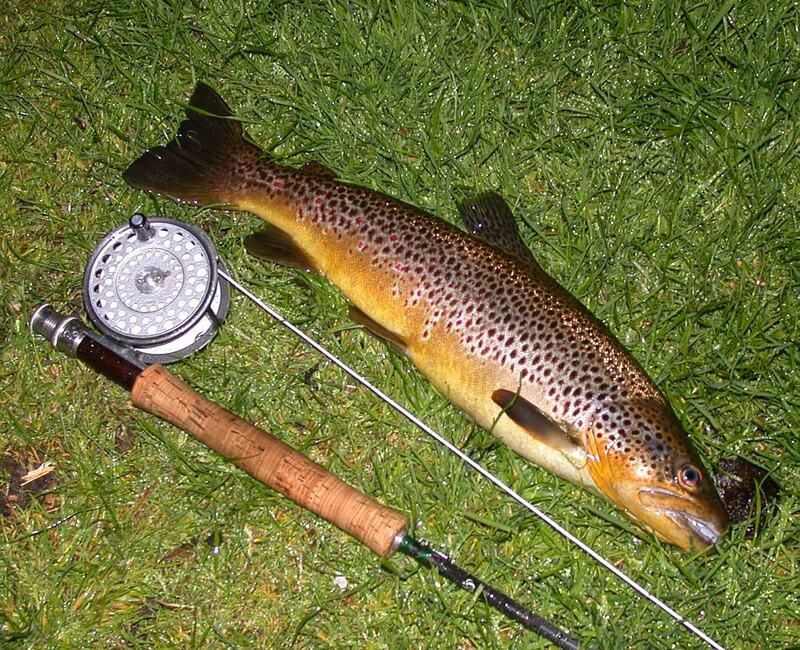 Trout can be caught in river or loch in conditions that might defeat the most diligent and skilful of salmon anglers. That is not to say, of course, that Scottish trout are always easily caught. They can be gey dour at times. Unlike the salmon and sea trout, though, the trout do need to feed throughout the year and we can make reasonable judgements on how trout are likely to behave in given circumstances and choose our fishing tackle, flies and tactics accordingly. But before we can begin to think about an appropriate choice of trout fishing tackle, the most likely tactics or the contents of our fly box, we will need to decide where in Scotland we are going to fish. This is no easy task, neither is it an unpleasant one, spoilt for choice as we are here in Scotland. For a fortunate few, living on the banks of the Don, Tweed or Clyde or on the Isle of Lewis, surrounded by trout lochs, the decision on where to fish might be an easy one. For others, living in the more densely populated central belt, or travelling from farther afield, a bit of thought, research and planning is required in our choice of fishing destination. Will we fish on river or loch, large or small, north or south, highland or lowland, from boat or bank? When will we go? Where will we stay? Where can we buy a permit? Once we have made the vital decision on where we are to fish, we can then give some thought to the fishing tackle, tactics and flies which might be most appropriate in outwitting the humble Scottish broonie. To help in the planning of a trout fishing trip in Scotland, you will find information, maps and photographs of the major Scottish trout lochs and rivers in the "where to fish" section and a few ideas which I hope might be helpful in the "tackle", "tactics" and "flies" sections. A new fly fishing club with membership open to all. Seasonal membership is very reasonably priced, which covers all bank fishing with no further cost, although fishing sessions must be booked on individual lochs online via the website. The club has 41 lochs available for members to bank fish and boats are available for members on 10 lochs with a minimal charge applying.